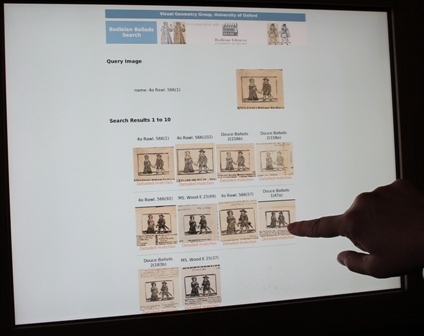 Choose an area within the digital scan of an item. Image matching software finds the illustration appears in multiple different items. 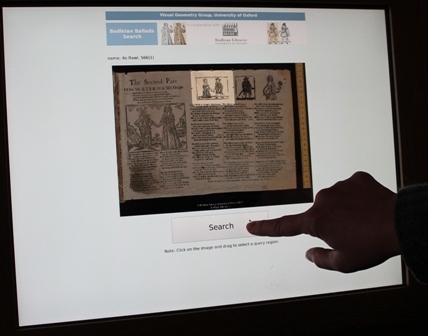 A demonstration of image matching software developed to enable scholars to compare printed images is now running in the Bodleian Library. Alongside a display of broadside ballads printed in the 17th and 18th centuries is the 21st-century technology that reveals how early modern printers copied woodcut blocks to illustrate different publications. At a lecture on Tuesday, December 4, in the library’s Convocation House, Giles Bergel (English Faculty) will be joined by Professor Andrew Zisserman and Relja Arandjelovic (Visual Geometry Group, Department of Engineering), to talk about how the software was applied to thousands of items from Bodleian Library collections of printed ballads. 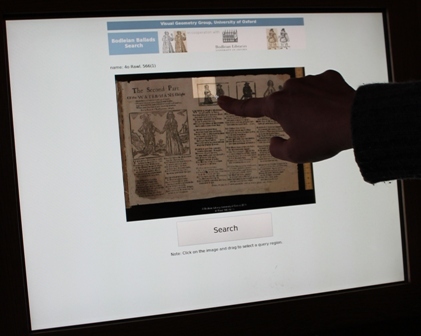 See blogposts about image matching in the Bodleian Ballads blog. I came across a box of maps in the Dunston collection. 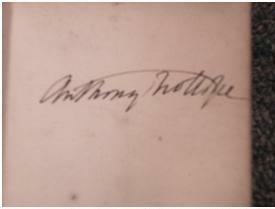 Whilst cataloguing a city plan of Paris I realised that it was signed by the novelist Anthony Trollope. The map is Nouveau plan de la ville de Paris, divisé en 12 arrondissements et 48 quartiers. (1839). It is reasonably large at 59 x 87 cm, but folded into a cover to make it pocket-sized. It is typical of its age and type with a street index and vignettes of Parisian landmarks. The arrondissements are outlined in different colours, but the inaccuracy of the appearance indicates that this was carried out post purchase. 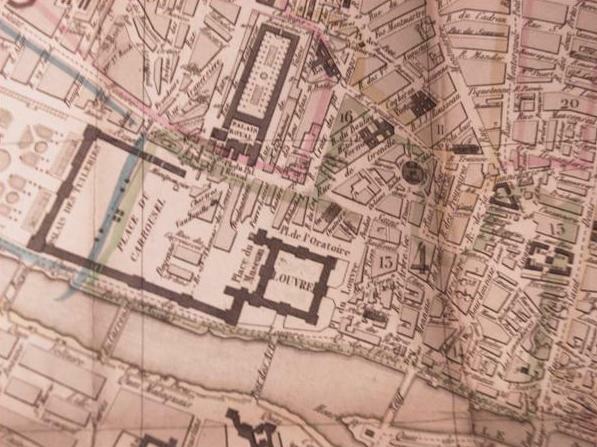 It is not known whether Trollope had the map for his own use as a visitor to the city or to use as reference material for his work La Vendée: An historical novel. His brother, Thomas Adolphus Trollope, also wrote three travel books on France so this map may have come to Anthony that way. 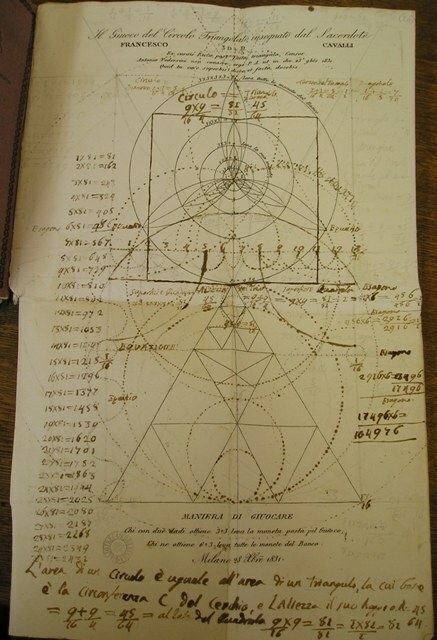 This volume contains a collection of printed and manuscript items relating to one man’s quest to solve the mathematical problem of squaring the circle. The challenge of constructing a square with the same area as a given circle using ruler and compass and a finite number of steps is an ancient one, but was finally proven to be impossible in 1882. The collection reveals the author’s obsession with the problem, his apparent solution, and his quest for recognition in a world that appears not to have taken him seriously. Other than a connection with Bergamo, and the suggestion that he is a priest, we have no biographical information about the author, and his name Francesco Cavalli is perhaps a pseudonym, as he also uses “Sacerdos Franciscus de Caballis”, possibly with reference to the physician, astrologer and Professor of Medicine at Padua of the same name, who died in 1540. The items, many of which are single sheets, or multiple editions of short works, range in date from 1830-1835, and are printed mostly in Milan. 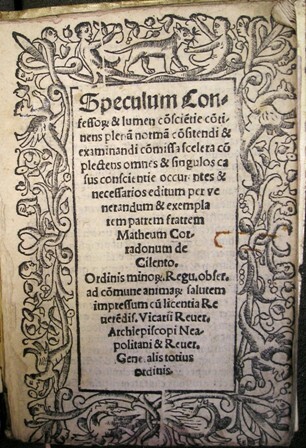 The contents vary from verses in Latin about justice, recognition, and truth (relating to the sense of injustice Cavalli expresses at the world ignoring his supposed solution), engraved geometrical diagrams and proofs, to gambling games to be played with dice, and instructive works that emphasize the importance of learning mathematics by practice rather than by theory. The collection also contains manuscript letters to and from the Istituto delle scienze ed arti in Milan, regarding Cavalli’s supposed solution, his request for a prize and recognition, and the Institute’s demands for written proof of the solution. The Institute was not alone in not taking him seriously. Item (15), written by Cavalli under the pseudonym il Muto dell’Accia al collo di Pavia, records the author’s fall from favour in the preface, and is a sarcastic response to a letter written by a rival during the 1831-32 carnival, perhaps Gli ultimi giorni del Carnovale 1832 a Milano ossia, ecco la mia opinione intorno a tutti gli spettacoli dati alla Scala … : seconda lettera dell’uomo di pietra di Milano al muto dell’accia al collo di Pavia (Milano; Bonfanti, 1832). The response includes scathing verses about the rival with the title “Biografia d’un bevitore” (Biography of a boozer). Item (18) shows Cavalli advertising a public demonstration of his solution, and item (30), which is not by Cavalli, regards a prize offered by the Lombardo-Venetian Kingdom for research into the ill effects on health of air and of drinking water. Many of the items contain manuscript notes and diagrams, and diagrams and illustrations have been pasted onto blank spaces, including a portrait of a man who is perhaps the earlier Francesco Cavalli. The printed items are not recorded elsewhere, and present some bibliographical problems. The presence of printed wrappers bound with some items cause some confusion over whether particular items are separate bibliographical entities, or parts of larger collected works, where the works enclosed by the wrappers do not correspond exactly with the contents printed on the wrappers themselves. 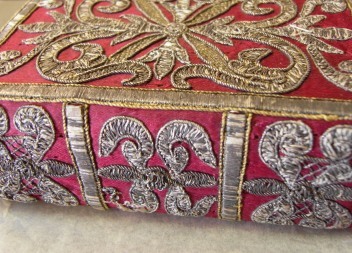 The manuscript items in the collection have been separately electronically catalogued by Western Manuscripts, under the category “Manuscripts in Printed Books”. 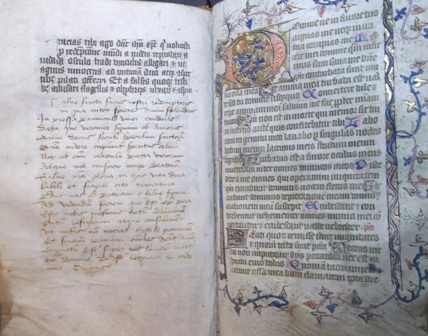 In copying late Middle English, as in copying other languages, scribes in fourteenth- and fifteenth-century England drew on techniques long established in practice but seldom written down. Those techniques of the scribes, their collaborators and their readers can be reconstructed from the manuscripts themselves. These techniques might sometimes have been ‘tacit’, as good as unthinking; but what is intriguing is the question whether correcting ever reflects conscious ‘second thoughts’ about the text corrected and about the process of copying it into a book. Sometimes scribes fix practical problems in scribal labour; sometimes they stop to emend or even collate texts in ways which suggest their reading of, or attitudes to, the language and works they copy. Correcting is thereby a crucial part both of the history of book production and of an interesting period in the history of responses to English language and literature. Daniel Wakelin came to Oxford in 2011 as Jeremy Griffiths Professor of Medieval English Palaeography in the Faculty of English and a Fellow of St Hilda’s College. He formerly taught in the Faculty of English and Christ’s College in Cambridge. 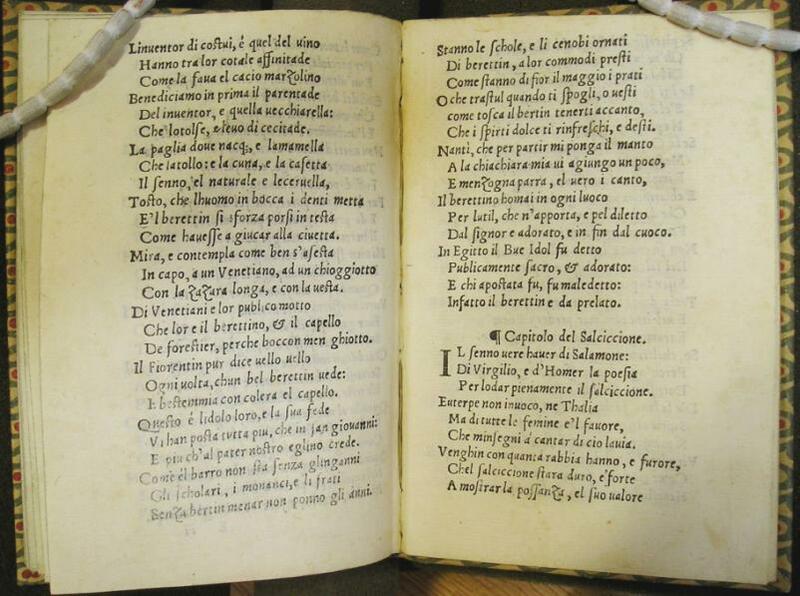 A collection of Italian verses on a variety of subjects, including: the hat, gypsies, the goose, the horse, mustard, the cap, and sausages. The date, suggested by the British Museum’s Short-title catalogue of books printed in Italy, is supported by an early manuscript note in this Bodleian copy, which includes the date 1545. This Italian text serves as a guide for confessors, providing them with questions to put to those who come for confession. Each question, or set of questions, for example, “Have you cursed the sky and the stars, sun, and moon?”, is followed either by an instruction – “You have to ask how many times: ten or a hundred, etc., or more or less, etc.” – or by a statement of the seriousness of the sin (for example, “mortal”), together with references to autoritative texts on the matter. The book is held in a re-used Parchment wrapper containing a manuscript document apparently from a widow to her confessor. She asks the confessor to intercede with the bishop on her behalf, in connection with her desire to enter religion. Vita, e dottrina di Gesu Cristo raccolta da’quattro evangelisti, Nicola Avancini. Parma: Galeazzo Rosati, 1686. Bodleian Library Vet. F3 f.128. Localizable and datable manuscripts are in short supply in western Britain at the end of the first millennium. As a consequence a limited number of models is available to interpret the unlocalized evidence we do have. This seminar looks at a very striking instance of a manuscript assigned an English origin, containing a text of extreme pertinence to the English Benedictine reform movement of the tenth century, but copied by a scribe who was trained in a centre outside the English mainstream, under Welsh or Irish influence. The historical and palaeographical challenge of this manuscript is compounded by the fact that it represents perhaps the earliest specimen of Caroline minuscule, the script of the reform, to have been written by a scribe on this side of the English Channel. Bodleian Library MS Barlow 33, fol. 28v, 29r, showing a prayer for indulgence added by a user before the beginning of the penitential psalms. A large class of 50 heard Kathryn Rudy demonstrate the methods and results of a stratigraphic analysis* of manuscripts, through which the history of how the textual and pictorial units were assembled, and the layers of evidence of use, yield a picture of the manuscript’s role within reading practices. 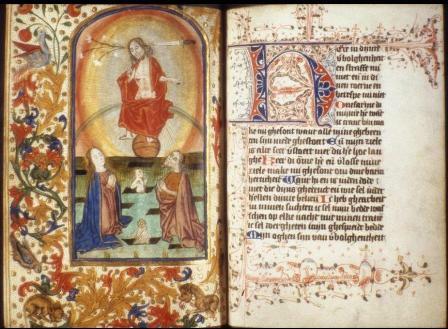 Dr Rudy showed examples of 14th and 15th-century devotional manuscripts from the Netherlands now in Bodleian Library collections. Through a close examination of the manuscripts, participants looked at evidence of how texts and miniature paintings had been assembled or added, either on behalf of or by the owner, and marks left by the handling of leaves or the kissing of images. Dr Rudy’s class begins a season on additions and annotations, which will extend to the stratigraphy of printed books with Will Poole’s and Jackie Steadall’s examination of scholarly reading in the early modern period (masterclasses, 2:15 pm in the Pitt Rivers Lecture Room, 29 October and 26 November) and Nathalie Ferrand’s Besterman Lecture on Rousseau’s annotations (Convocation House, 8 November, 5:15 pm). 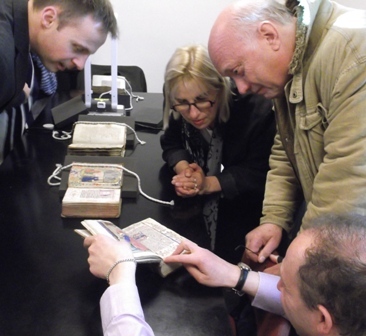 Professor of Palaeography Daniel Wakelin, Kathryn Rudy, Nigel Palmer, and Martin Kauffmann (Bodleian Library) examining a manuscript in the class. Dr Kathryn Rudy will give the second masterclass of Michaelmas term on Monday, 15 October at 2.15pm, in the Pitt Rivers Museum Lecture Room. Medieval manuscripts had a long shelf-life and often changed hands many times. Made of durable parchment—supple as paper but tough as leather—they could easily serve multiple owners and users over a period of decades or even centuries. Laypeople often handed their books down the generations or sold them. The updates people made to ‘granny’s book’ often reveal the new fashions in prayer culture, and along with that, their culturally-constructed hopes and fears. In this masterclass we will look at prayerbooks made in the century before the Reformation; although we will use the methodology of codicology and stratigraphy to study books closely, the session is really about people and what they revealed about themselves through their manipulations. At the end of the fifteenth century, people often had two goals when they updated their books: to give them more decoration, and more indulgences. Dr. Rudy is lecturer in art history at the University of St. Andrews. She has written on real and virtual pilgrimages, the word as image, proverbs in medieval marginalia, and the ways in which medieval users handled their manuscripts. Her most recent book is Virtual pilgrimages in the convent: imagining Jerusalem in the Late Middle Ages (Turnhout, 2011).